Listening: to a ton of Christmas music! When I used to work in retail I always looked forward to the day after Thanksgiving when they begin playing all the Holiday classics. I love Christmas music and can listen to it all the time without ever getting tired of it. During this season I finally get to bring out some of my favorite holiday records such as one of the classics 'How the Grinch Stole Christmas' and of course the She & Him holiday vinyl. I recently picked up a couple new records which I already shared in part two of my record collection so don't forget to check that out. I also really enjoy the Glee cast holiday music. I used to always play their station on Pandora until I discovered Spotify. They have some really great recreation to some of my favorite Holiday songs. Pinning: a lot of home inspiration photos over on Pinterest! I go through phases where I use Pinterest a lot and then not so much. Recently I have been slowly adding photos of homes that give me so much inspiration for my future home. I've only ever had a bedroom to decorate, which has always been so much fun! However, an entire house is well a lot! There are so many possibilities and I've been really into interior lately it's going to be a lot of fun finding my style. I've already noticed a theme in the photos I have saved. I'm a very indecisive person so having a lot of photos pinned for ideas will be great and helpful. It's going to be fun putting together a home with Rudy as newlyweds. If you want to check out what I have been pinning click here. Loving: Jo Malone fragrances! Early this month Rudy and I went back home to California for a few days. During our visit, I purchased, well Rudy gifted me the Jo Malone Peony & Blush Suede Cologne I wanted from my Christmas wishlist and I've been wearing it nearly every day. It will most likely be in my monthly favorites this month. Since that purchase, I've been adding more scents to a Jo Malone wishlist of mine. Jo Malone has very quickly become my favorite perfume brand. There's so many delicious scents to choose from and whats really neat about their colognes is that they can be used to layer on top of one another. I have yet to try combining any fragrances but its a really cool idea. Anxious: for The Magicians season three premiere! I've mentioned the show The Magicians a couple times early this year when I first started watching the series. Rudy and I are really into this show. Season one was amazing! Season two started off very good but ended before I was ready. That always happens though doesn't it? Season three comes back in the beginning of January, so it's soon. I know I've already said it before but I love movies that have to do with magic and shows that have to do with magic. The Magicians is a mix of Harry Potter and Narnia for adults. I definitely recommend you giving it a try, season one and two is on Netflix and I'm rewatching it. I can't wait to see whats going to happen with everyone since magic is now gone. Excited: for mine and Rudy's first Chrismas as Mr. and Mrs! I still can't believe we're married. Even though we aren't doing much this Christmas season it's still pretty exciting getting to celebrate as Mr. and Mrs. It's been so fun receiving Christmas cards from loved ones addressed to the Zambranos, something I never thought I'd get excited or giddy over. 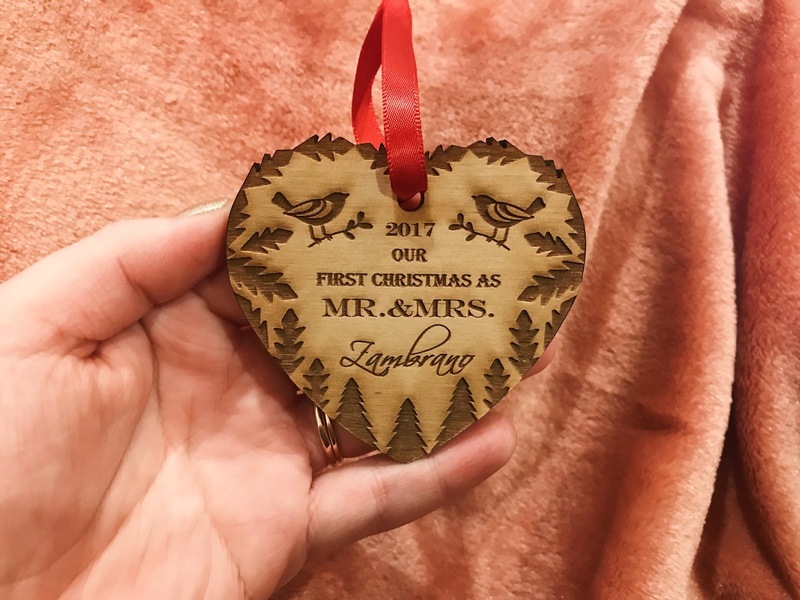 I purchased two ornaments for us, one is our first Christmas as Mr. & Mrs. Zambrano, and second a gorgeous gold monogram of the letter Z. I can't wait to hang them in our own tree in our own home next year! I've been loving Jo Malone fragrances too! Happy Holidays too!! They're some of the best. I would love to fill my home of his fragrances. Christmas music is the best. I can't believe some of our radio stations here has already pulled the plug on them. So depressing. Thank you so much lovely and I hope you. had an amazing Chrismtas. Aw, I love this kind of post! Have a fab Christmas!